Maggots are the lovely larvae of flies. Here’s how it all breaks down. Flies lay eggs in dead plants or animal debris. These eggs hatch in less than one day into maggots. Maggots become pupae then turn into adult flies. The beautiful circle of life then continues. Most of the time, we find maggots in open wounds. They are considered undesirable and are promptly removed by your queasy veterinary team. Yet in some cases, we can use maggots to our advantage. It is called maggot therapy. Amazingly, maggots have been used since antiquity. We have accounts from Mayan Indians and Australian Aboriginal tribes who used them successfully. When we treat an old or infected wound, we need to remove the unhealthy parts in order to help the healthy tissues heal. This phase of treatment is called debridement. Maggots excel at debridement when they are used in a controlled manner. 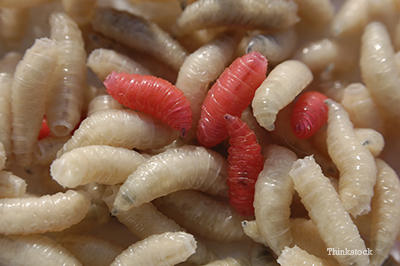 There are FDA-controlled commercial labs that produce sterile maggots, which physicians and veterinarians can use in their patients. An order is placed, and the lovely creatures are shipped overnight! The maggots are then placed in the wound of a patient, where they do their job (eating dead tissue while leaving healthy tissue intact), and can be removed after a few days. At that point, the wound has been cleaned up and can usually be sutured closed. Another surprising treatment that can be used to our advantage is leeches. Leeches are worms, most of which live in water and are bloodsuckers. This is typically enough to repulse most individuals. Yet the medical-grade variety, which can reach up to 20 cm, can be used to help with wound healing. This is called hirudotherapy. Leeches were used in Greece during the 5th century B.C. under the guidance of Hippocrates. Leeches were used for bloodletting – granted, a more elegant technique than using a good ol’ knife. More recently, when surgeons began to perform plastic surgery such as skin grafting, they rediscovered the creepy worms’ capacity at decreasing swelling in engorged skin. This speeds up healing by allowing oxygenated blood to reach the skin. Part of the blood is sucked into the leech. In addition, because the worm produces anti-clotting substances, the wound then continues to lose some blood after the well-fed critter detaches itself from the skin. The end result is healthier skin. Both maggot and leech treatments are pain free and can significantly speed up healing. Maggots and leeches have been used for centuries, and have been scientifically proven to help with open wound management. It’s interesting how we seem to rediscover ancient remedies that actually work.